The owner who reported that she and her family were having various subjective paranormal experiences contacted the Southern Wisconsin Paranormal Research Group (S.W.P.R.G.). Various family members have had experiences in the current location and at other locations as well. The main activity reported at the current location includes: hearing voices, footsteps on the second floor hallway and bedroom, and the sighting of an apparition in the boys second floor bedroom window. The apparition of the woman scared the boys and the father didn’t find anyone inside or outside when he investigated the area. The experiences tend to occur frequently in the early afternoon or later in the evening. Triaxial ELF magnetic field meter with pc interface. The meter has a bandwidth of 30Hz to 2000Hz and an accuracy of +/-3% at 50Hz/60Hz and +/-5% at 40 to 200Hz. Data was logged using the supplied software. Tri-field natural EMF meter modified to be data logged by the HOBO data logger. Fluxgate Magnetometer Model 539 with APS software. Set to collect approximately 400 samples per second. Data was analyzed using SigView. All equipment was calibrated and tested prior to use according to manufacture specifications. We decided to set up the equipment on both floors in the locations where the majority of activity was reported (upstairs bedroom, upstairs hallway, stairway from main floor to second floor, and in the main floor living room). Surveillance cameras (IR DVR and DV cameras) and D.E.A.D. system were placed throughout the before mentioned areas. Ion counts, gauss meter readings, and radio frequency analysis was done. Various data sweeps were done throughout the location. Investigator personal experiences were recorded. EVP sessions were conducted in the upstairs hallway and bedroom. Nothing of note was seen in any of the video footage. Positive and negative ion counts ranged from 200 to 800 ions/cm3 throughout the location. Positive ion counts were slightly higher (500 to 1500 ions/cm3) near the ceiling of the main floor family room and near the floor of the upstairs hallway and boy’s bedroom. These are the areas that footsteps have been heard to be coming from. Gauss meter readings of 500 to 700mG were recorded throughout various locations in the location. This is within the normal expected range. Baseline EMFs were 0.5 to 3.0mG throughout the location. A 100mG+ area was located in a 2 ft X 2 ft section of the stairway hall. Please see the DEAD section for more EMF data. There was nothing to note for the ambient temperature readings taken at any of the locations. Eighteen potential EVPs were recorded of which 5 were considered for further analysis. In four of the EVPs one can hear very soft whispering voices and the other one has the sound of a bump or thud. None of these sounds were heard during the EVP recording sessions and there is no mention in any of the investigator’s notes about someone making noise. 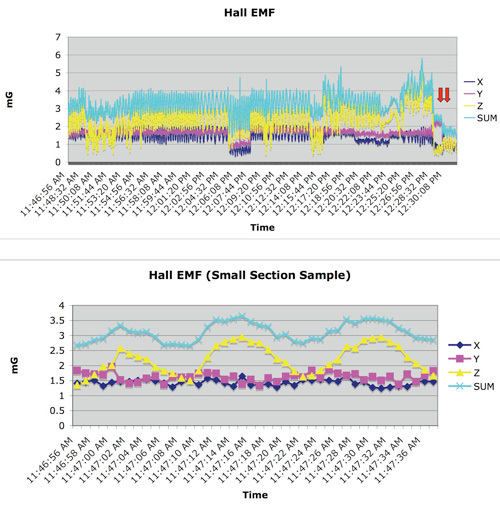 There were also changes in the EMFs associated with these EVPs. There was nothing to note with Natural EMF, radiation, temperature, humidity, or light intensity. There was some interesting data in regards to the EMF. The graphs below to the EMF data collected for the second floor hallway and the second floor boy’s bedroom. These are the locations were the footsteps have been reported to be coming from and where EVPs were recorded (as indicated by the red arrows on the graph). It is evident from the graphs above that there is considerable variability in the EMF over a given time period. EMF variability has been noted in investigations of other reportedly ‘haunted’ locations (Braithwaite and Townsend, 2005; Bell et al.,1992; Bell et al., 1994; Randall and Randall, 1991; Persinger and Koren, 2001; Persinger et al., 1973; Roll and Persinger, 2001; Wiseman et al., 2002; Wiseman et al., 2003). It is currently not known where this variability comes from. It should be noted that there were changes in the EMF at various points when EVPs were recorded. The significance of this correlation is unknown because there were times when the EMF changed and no EVPs were recorded. The ‘dips’ in the EMF in the ‘kids room’ happened approximately every 25 to 30 minutes. This would seem to indicate a normal/natural cause for the fluctuations. However, the ’spikes’ in the EMF in the ‘kids room’ and the fluctuations in the downstairs living room are more sporadic and curious. Though it is difficult to conclude if the location has definite paranormal activity, the experiences reported by the residents and the data collected is consistent with that from other reportedly haunted locations. Bell, G. B., Marino, A A., & Chesson, A L. (1992). Alterations in brain electrical activity caused by magnetic fields: Detecting the detection process. Electroencephalography. Clinical Neurophysiology, 83, 389-397. Bell, G. B., Marino, A. A, & Chesson, A L. (1994). Frequency-specific responses in the human brain caused by electromagnetic-fields. Journal of Neuro Sciences, 123, 26-32. Braithwaite, J. J. & Townsend, M. (2005). Sleeping with the entity – A quantitative magnetic investigation of an English castle’s reputedly ‘haunted’ bedroom. European Journal of Parapsychology, 20, 65-78. Persinger, M. A, Ludwig, H. W., & Ossenkopp, K. P. (1973). Psychophysiologicaleffects of extremely low frequency electromagnetic fields: A review. Perceptual and Motor Skills, 36, 1131-1159. Persinger, M. A, & Koren, S. A (2001). Predicting the characteristics of haunt phenomena from geomagnetic factors and brain sensitivity: Evidence from field and experimental studies. In J. Houran & R. Lange (Eds. ), Hauntings and poltergeists: Multidisciplinary perspectives (pp. 179194.). Jefferson, North Carolina: McFarland & Company, Inc.
Randall, W., & Randall, S. (1991). The solar wind and hallucinations -a possible relation to magnetic disturbances. Bioelectromagnetics, 12, 67-70. Roll, W. G., & Persinger, M. A (2001). Investigations of poltergeists and haunts: A re view and interpretation. In J. Houran & R. Lange (Eds. ), Hauntings and poltergeists: Multidisciplinary perspectives (pp. 123-163). Jefferson, North Carolina: McFarland & Company, Inc.
Wiseman, R., Watt, c., Greening, E., Stevens, P., & O'Keeffe, C. (2002). An investigation into the alleged haunting of Hampton Court Palace. Psychological variables and magnetic fields. Journal of Parapsychology, 66,387-408. Wiseman, R., Watt, c., Stevens, P., Greening, E., & O'Keeffe, C. (2003). An investigation into alleged 'hauntings'. British Journal of Psychology, 94,195-211.